Dry Scalp Treatment – Shea Butter provides moisture to dry or damaged hair from the roots to the very tips, repairing and protecting against weather damage, dryness and brittleness. It also absorbs quickly and completely into the scalp to rehydrate without clogging pores. It is particularly beneficial for processed and heat-treated hair. It is an excellent treatment for dry scalp. It restores luster to damaged hair. For this reason, Shea Butter is an excellent ingredient in hair moisturisers, shampoos and conditioners. Restores Elasticity – Heat styling methods like blow drying, flat ironing or curling decrease hair’s elasticity by stripping moisture from the hair. Hair that is chemically processed also often loses some elasticity. This can cause hair to become prone to breakage and damage. Hair quickly absorbs shea butter, restoring moisture and elasticity. Natural – While there are types of shea butter that have been highly processed, shea butter is effective in its natural form. There are many brands of shea butter available to treat hair with no added chemicals. 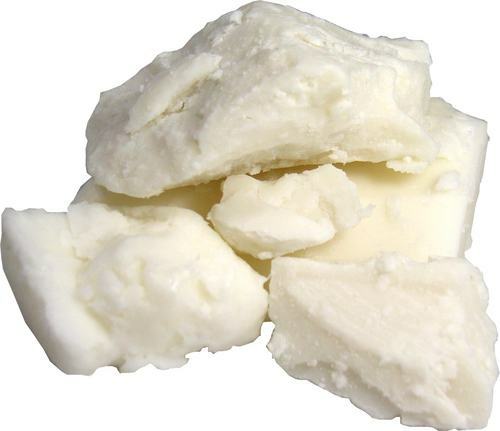 Application – You can apply shea butter directly to your hair and scalp, making it easy to use. Unrefined shea butter is solid and may need to be melted down some to spread easily. You can melt shea butter by placing it briefly in the microwave or just by rubbing it between your palms. Storage – Shea Butter does not need to be refrigerated. However, over a period of two or three years, the Shea Butter will begin to lose some of its effectiveness. As the natural ingredients begin to break down, some of the healing benefits will be reduced, but the Shea Butter will continue to be an effective moisturizer. Store Shea Butter is a cool (not necessarily cold) place. If you’re going to use it within a couple of years, you should have no problems.